Pour les instructions en Français, cliquez ici. 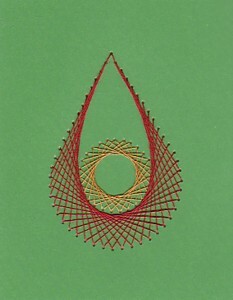 These instructions are for the teardrop shaped pattern. If this is the first time you have tried paper embroidery, I recommend using heavy card stock as it will not tear as easily as the lighter weight card. I also recommend using a high quality embroidery floss such as DMC. The first few cards I made I used cheap floss and it frayed as I pulled it though the card, leaving the lines looking fuzzy. 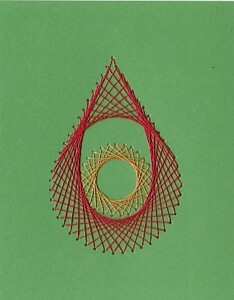 Continue around the circle advancing one hole clockwise with each stitch. As you work your way around your stitches will begin to overlap. Make sure that you do not skip any stitches. 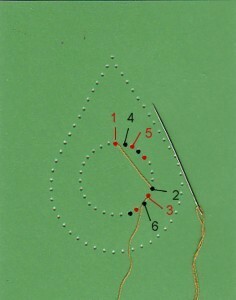 When you are done, each hole should have two stitches. 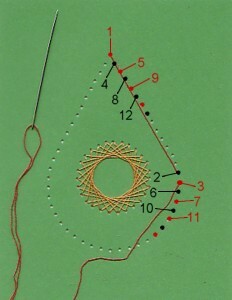 Continue the rest of the way around the circle until each hole has two stitches. Tape the end of the floss to the back of the card. 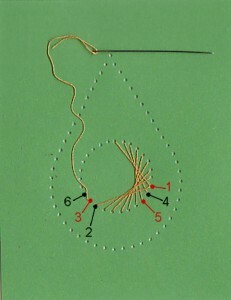 Start at the top of the teardrop using one strand of red floss. Refer to the picture to the right. Bring the needle up at 1, count forward 14 holes and bring the needle down at 2, up at 3, down at 4, etc. 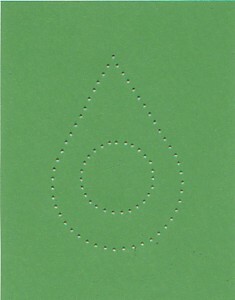 Continue clockwise around the teardrop. Your stitches will overlap as before. Make sure that you do not skip any stitches. 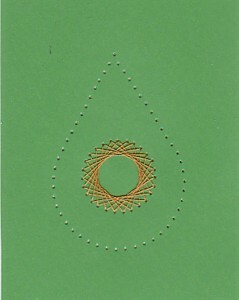 When you are done, tape the end of the floss to the back of the card. 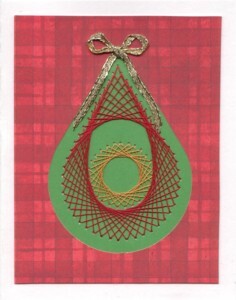 Mount your finished work on the front of the card blank, using the decorative paper as a frame. Add a gold bow to the top.